Watch this video & get the 3 questions to ask your heart and soul so you create a year you LOVE – its a new year self-love meditation! I’ve been playing this game all week — with Noah, at dinner with friends, even with my 11 year old goddess daughter – she loved it! The game is based on 3 core questions that help you connect to what YOU truly desire to do, so you create a year devoted to your happiness and success instead of creating more stress for yourself, or creating goals that just make it so you have more to do! 1. What do I desire to START? 2. What do I desire to STOP? 3. Who do I desire to CONTINUE? Then to bring these to life take a stand to devote this year to YOUR HAPPINESS and SUCCESS! START writing thought provoking, heart opening articles that shine a light on the tremendous amount of pressure we all feel… and to shine a light on a new way of being that is more sustainable for us all. STOP working through the beautiful sunsets right out side my door – they are too beautyful to miss! 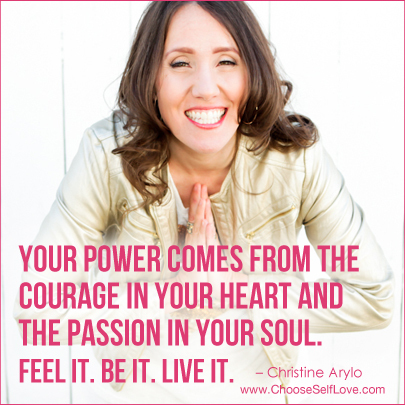 This entry was posted in Self-Empowerment, Self-Honor & Self-Respect and tagged christine arylo, creating goals i love, new year meditation, new year process, new year self love, self empowerment, self love on January 6, 2015 by Christine Arylo. Yes, you want to take care of yourself. Yes, you want your life to feel in balance, in harmony. You want to feel vital, strong, and cared for. You know self care is good. Yet there are many things that can come into your ‘field’ (your body, mind, emotions, relationships, life) that drain your resources (time, energy, money, peace, life force)… and you simply can’t afford to have these things depleting you. Self care is making sure that YOU receive what you need. 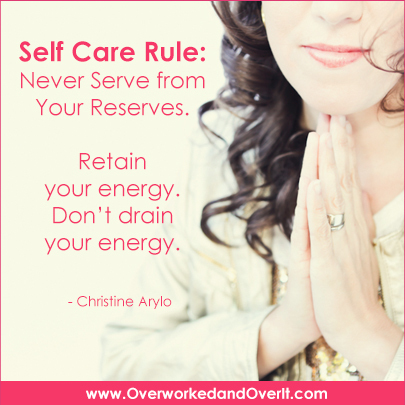 Self care requires you never serve from your reserves. Which means you need to SUSTAIN not DRAIN your energy. How? Well watch this self love spark I taped for YOUR HEART, to slow down, and take a look at your ‘field’ to see what is draining you. Be honest. Your life force depends on it. I taped this video for you on the equinox, which is all about balance. It literally is the mid point between the solstices, and it’s a time to take stock of the field you’ve planted (think agriculture and growing crops which is a metaphor for the field and crop of your life each year.) And as you take stock of your personal field, your life, this is the time to choose to harvest what will sustain you over the winter and choose to compost that which is draining or no longer nurturing. WHAT IN MY LIFE DRAINS ME? WHAT IN MY LIFE SUSTAINS ME? This could be relationships, jobs, situations, ways you work, finances, anything really. Don’t hold back. Be honest with yourself. Even if that means admitting your job, your kids, your whatever are draining you. Because once you can be honest about the drain, you can see the ways in which you can transform the drain into something that sustains you or at the very least stops draining you. And here’s the other thing to note – something that once sustained you could now drain you, and it’s up to you to see when that balance shifts, and then love yourself enough to respond to new circumstances and make the shifts inside of yourself and your life to create a most sustainable life. and then i will witness you! Here i will go first. 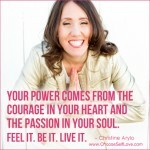 This entry was posted in Self-Care, Self-Empowerment on September 23, 2014 by Christine Arylo. There’s a lot of misunderstandings about dreams that can mess up your manifesting. Watch this video & get the divine download on how dreams really do come true. 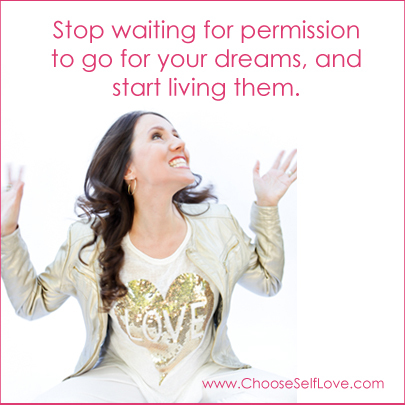 Choose self empowerment, choose self-love. What is your Sacred Dream for the World? What is your Sacred Dream for Yourself this year? And are you going about dreaming in the ‘right’ way? I used to think that dreams happened in the future, that I had to pursue them, manifest them, make them happen, or just get lucky. And that caused a lot of pressure, disappointment and frankly hard work. There is SO much misunderstanding about how dreams really work — information telling you to make vision boards, to apply the Law of Attraction, to manifest your soul mate or more money in simple 7 steps, or whatever as if dreams are some magic trick that pop out of a hat. As if you just have the right thoughts and focus hard enough, you’ll get exactly what you want. And it just doesn’t work that way. It’s not that the Law of Attraction, or vision boards or desiring a soul mate or money is incorrect, it’s the energy, the ego, and the attachment, and the partial truths and over-simplification that lead to misunderstandings that can lead you into a lot of disappointment, stress, and pressure around your dreams becoming your reality. Watch this Love Letter video and clear the way for your sacred dream for the world and for yourself this year to come in. And then put Self Love Day on your calendar and choose how you will participate this year! AND… I’d LOVE to witness YOUR SACRED DREAMS! Post your Sacred Dream For the World and Your Sacred Dream for Yourself for this year, here and I’ll witness, bless it and send you divine love. Okay, now your turn… post here now. This entry was posted in Self-Empowerment and tagged christine arylo, how dreams come true, madly in love with me, manifesting dreams, new year dreams, self empowerment, self love on January 17, 2014 by Christine Arylo.